In a previous post, I showed you how to play Last Day on Earth on PC and Mac using BlueStacks. This allows us to play the Last Day on Earth: Survival game on a bigger screen with implemented keyboard controls. However, in this guide, we’re going to install a cheat and install a save file. As you can see on this image, this character from a save file is Level 99 with 363000 unlock points as seen at the bottom. Installing this Last Day on Earth save file will pretty much give you almost 100% completion. It will also give pretty much unlimited coins, all blueprints unlocked and a huge base. We will begin by force closing Last Day on Earth. Go to the ‘My apps’ screen, open the Systen Apps folder, then Settings. Choose Apps in the menu, then Last Day on Earth: Survival and click Force Stop. If it’s greyed out, that means it’s not running. Install ES File Explorer inside of BlueStacks. Just search for it in the top right of the app store. Once it’s installed, open it. On the left hand side, choose “Local”, then select “Internal Storage”. 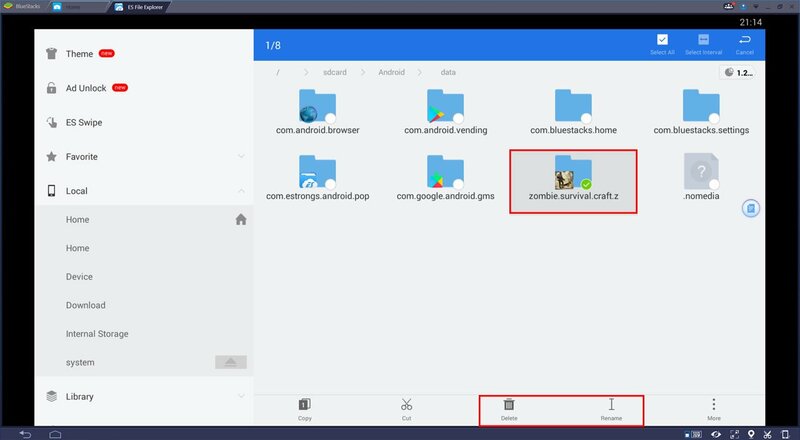 Now on the right hand side, select ‘Android’, then ‘Data’ and delete the folder called ‘zombie.survival.craft.z‘. You can do this by holding the left mouse button down on top of the folder and pressing delete at the bottom. This will delete your save game data for Last Day on Earth, so if you want to keep it, just rename it to ‘zombie.survival.craft.z.abc‘. 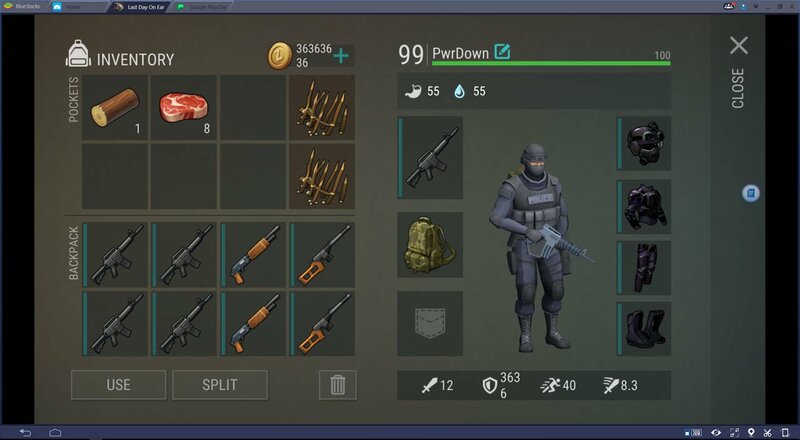 Now we need to download a mod apk/save file for Last Day on Earth. Head to this page here. Personally, I chose “DOWNLOAD 99lv save with 999999 HP, heap of coins“, which you can find by scrolling down. You can find a direct link to download the Save file here, which works with 1.5.9. Open up BlueStacks again, and go into ES File Explorer. On the left, choose ‘Local Storage’, then ‘Internal Storage’. On the right, select Windows, then Documents and look for the folder we put in there before. Hold down the mouse button on it, and choose copy. Again, we need to go back to the game folder. So on the left hand side, choose “Local”, then select “Internal Storage”. Now on the right hand side, select ‘Android’, then ‘Data’. Press the paste button to paste the game save files. Open Last Day on Earth with BlueStacks and you should have a completely modded and cheat save, with unlimited coins and all unlocks! In bluestacks, in the internal storage, when i clicked on the windows folder there was no option for documents. It only says “Open As, text, audio, video, image, other” under the “other” tab there was also no option for documents. How do i fix this. Is there another download site available that does NOT ask for a credit card?